The Village at Snowshoe Mountain in Pocahontas County. Snowshoe has been ranked as the best overall ski resort in the Mid-Atlantic and South East regions and fourth-best in accommodations on the East Coast. Tourism is a large industry in the state, producing a $13 million daily economic impact. The economy of West Virginia nominally would be the 62nd largest economy globally behind Iraq and ahead of Croatia according to 2009 World Bank projections, and the 64th largest behind Iraq and ahead of Libya according to 2009 International Monetary Fund projections. The state has a projected nominal GDP of $63.34 billion in 2009 according to the Bureau of Economic Analysis report of November 2010, and a real GDP of $55.04 billion. The real GDP growth of the state in 2009 of .7% was the 7th best in the country. West Virginia's economy accelerated in 2014 with a growth rate of 5.1%, ranking third among the fastest growing states in the United States alongside Wyoming and just behind North Dakota and Texas. Morgantown was ranked by Forbes as the #10 best small city in the nation to conduct business in 2010. The economy of West Virginia nominally would be the 62nd largest economy globally behind Iraq and ahead of Croatia according to 2009 World Bank projections, and the 64th largest behind Iraq and ahead of Libya according to 2009 International Monetary Fund projections. The state has a projected nominal GDP of $63.34 billion in 2009 according to the Bureau of Economic Analysis report of November 2010, and a real GDP of $55.04 billion. The real GDP growth of the state in 2009 of .7% was the 7th best in the country. West Virginia was only one of ten states in 2009 which grew economically. While per capita income growth fell 2.6% nationally in 2009, West Virginia's grew at 1.8%. Through the first half of 2010, exports from West Virginia topped $3 billion, growing 39.5% over the same period from the previous year and ahead of the national average by 15.7%. Personal income growth in West Virginia during 2013 was only 1.5% - the lowest in the nation - and about half the national average of 2.6%. Overall income growth in West Virginia in the last 30 years has been only 13% (about one-third of the national average of 37%). Wages of the impoverished bottom 1% income earners decreased by 3%, compared to the national average for the bottom 1% income earners which increased 19%. Morgantown was ranked by Forbes as the #10 best small city in the nation to conduct business in 2010. The city is also home to West Virginia University, the 95th best public university according to U.S. News & World Report in 2011. The state is a global chemical hub, cited by the Council of American States in Europe as one of North America's premier destinations, with the presence of DuPont, Germany-based Bayer and Stockmeier Kunststoffe GmbH; a subsidiary of Japan-based Kureha, Ashland Specialty Chemical, Flexsys, and Brazil-based Braskem S.A. West Virginia has 80% community acceptance from the chemical industry nationwide, one of the highest in the nation. The chemicals industry accounts for one-fifth of manufacturing sector jobs and nearly 40% of the manufacturing sector's economic output in West Virginia. The state has one of the nation's highest concentrations of biotech industries aided by the presence of corporations such as Germany-based BASF and Bayer, DuPont, PPG, Dow, Mylan Inc., founded in White Sulphur Springs, and Texas-based Alcon. The Blanchette Rockefeller Neurosciences Institute at West Virginia University. Through 2008, 45,284 West Virginians were employed in advanced technology industries, which made up 5.6% of the economic establishments in the state. Through 2007, 91,998 citizens of the state aged 25–44 held bachelor's degrees or higher. West Virginia receives annually around $261 million in federal R&D funds, ranking 34th in the nation. Private establishments receiving the most federal R&D contracts in 2009 were Fairmont-based Prologic, Inc., Security Assistance Corporation, Ridgeley-based Alliant Techsystems, Inc., Berkeley Springs-based STS International, and the Fairmont-based West Virginia High Technology Consortium Foundation (HTC). 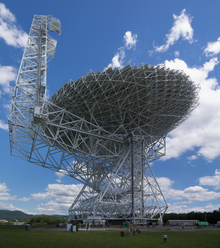 National Radio Astronomy Observatory's Robert C. Byrd Green Bank Telescope in Green Bank. The state is home to federal institutions such as the portions of the National Energy Technology Laboratory and Forestry Science Laboratory in Morgantown, the Leetown Science Center and National Center for Cool and Cold Water Aquaculture in Leetown, National Radio Astronomy Observatory in Green Bank, the Forest Service Timber and Watershed Laboratory in Parsons, the Appalachian Farming Systems Research Center in Beckley, West Virginia District Office of Water Resources in Charleston, and Department of Veterans Affairs R&D units in Clarksburg and Huntington. West Virginia University is home to research institutions such as the Blanchette Rockefeller Neurosciences Institute, Robert C. Byrd Cancer Research Laboratory, Center for Identification Technology Research, and the National Research Center for Alternative Fuels, Engines and Emissions. The Mid-Atlantic Technology, Research and Innovation Center, or MATRIC, is headquartered in South Charleston. In December 2010, the West Virginia Higher Education Policy Commission began a $23 million renovation of a research park formerly home to Dow Chemical. West Virginia is considered a national energy hub, leading the nation in net interstate electricity exports and underground coal mine production, while experiencing a growing natural gas industry as a result of the Great Shale Gas Rush. Overall, it produces 15% of the nation's fossil fuel energy. The state's underground natural gas storage represents 6% of the nation's total, and overall it has 5.1 billion cubic feet of natural gas reserves through 2008 estimates. West Virginia was one of the first states to engage in drilling for oil. Small to medium oil and natural gas fields still exist and are scattered mostly in the Allegheny Plateau and the Cumberland Plateau in an arc throughout the western part of state. The state produces around 180,000 barrels of oil per month, with 23 million barrels of reserves through 2008 estimates. The state has a growing renewable energy portfolio, anchored by chemical and biodiesel manufacturer AC & S, based in Nitro. Through 2009 Columbus-based American Electric Power was the fifth largest employer in the state, followed by Consolidation Coal Company at #9, Allegheny Energy Service Corporation #19, Eastern Associated Coal Corporation #31, Columbia Gas Transmission Corporation #40, Hobet Mining, LLC #45, Spartan Mining Company #48, and Elk Run Coal Company, Inc. #50. Coal is one of the state's primary natural resources, first discovered in the state in 1742. The industry employs 30,000 West Virginians directly, resulting in $2 billion in wages and a $3.5 billion economic impact. West Virginia coal exports declined 40% in 2013, representing a decrease of $2.9 billion in export sales. Overall, total exports declined 26%. West Virginia is the largest coal producer east of the Mississippi River, and accounts for 1/10 of the nation's production. It leads the nation in coal production from underground mines, and has the nation's second largest reserves behind Wyoming. West Virginia has an annual 13 million barrel coal-to-liquid fuel production capacity. Weirton Energy will begin construction of a new $1 billion coal-to-liquid fuel facility in January. It has an extensive network of railroads, and much of the coal is transported by rail. The railways were once one of the largest customers for coal to drive the steam locomotives, but these have been replaced by diesel locomotives. Coal is rarely used now for home heating. Most coal today is used by power plants to produce electricity, both in West Virginia, and in other eastern states. The Mountaineer Wind Energy Center was the first wind farm built in the state in 2002. The state has a growing renewable energy portfolio, anchored by chemical and biodiesel manufacturer AC & S, based in Nitro. The National Research Center for Alternative Fuels, Engines and Emissions is located in Morgantown. Mountaineer Wind Energy Center located in Preston County and Tucker County was the first wind farm built in the state in 2002. The Beech Ridge Wind Farm is a $300 million, 119 turbine project currently under construction in Greenbrier County. The Mount Storm Wind Farm is located in Grant County and operates 132 turbines. West Virginia is home to several hydroelectric facilities, including Honeywood Dam on the Potomac River, Cheat Lake Dam in Monogalia County, and Summersville Dam on the Gauley River. Google has invested in research exploration of the state's geothermal reserves. Major aerospace employers in the state include Pratt and Whitney located in Bridgeport, Lockheed Martin in Clarksburg, Goodrich Corporation in Union, Canada-based Bombardier Aerospace in Bridgeport, Alliant Techsystems, FCX Systems in Morgantown, and FMW Composite Systems and Aurora Flight Sciences of West Virginia in Bridgeport. West Virginia University in Morgantown had a $2.04 billion economic impact on the state in 2007, creating 21,600 jobs. In 2009, West Virginia University Healthcare alone had an economic impact of $2.2 billion on the state and was the #23 employer. West Virginia United Health System was the #2 employer in 2009, ahead of Charleston Area Medical Center at #3, St. Mary's Hospital #7, Cabell Huntington Hospital, Inc. #12, Wheeling Hospital #14, and Camden-Clark Memorial Hospital #24. In 2008, public higher education institutions had a $7.9 billion economic impact on the state, creating 40,600 employment positions. Private higher education institutions had a $345 million economic impact on the state in 2004, creating 6,258. West Virginia is home to steel and metal companies such as Luxembourg-based ArcelorMittal in Weirton, Steel of West Virginia Inc. in Huntington, Russia-based Severstal in Wheeling, Japan-based Nisshin Inc. in Wheeling, Follansbee Steel in Follansbee, Special Metals Corporation in Huntington, and Swanson Industries in Morgantown. In December 2010, Russia-based Mechel announced plans to construct a new $12 million coal processing plant in McDowell County. It is home to one of the highest concentration of resin producers in the world. General Electric Plastics is located in Washington. One of Bureau of the Public Debt's several buildings in downtown Parkersburg. The FBI's Criminal Justice Information Services Division is located in Clarksburg, NASA's Independent Verification and Validation Facility in Fairmont, and the U.S. Department of Treasury's Bureau of the Public Debt is located in Parkersburg. Between 1990-2004, the state experienced $1 billion in investment in the sector and 1500+ new employment positions. It is home to major automotive operations such as Japan-based Toyota in Buffalo, and others including Diamond Electric in Eleanor, NGK Spark Plugs in Sissonville, and Italy-based Sogefi and Japan-based Okuno International in Prichard. Forestry-based industries employ 15,600 West Virginians through major corporations such as Atlanta-based Georgia Pacific in Mount Hope, Seattle-based Weyerhauser in Heaters, North Carolina-based Coastal Lumber with several locations throughout the state, Virginia-based American Woodmark in Moorefield, and Pittsburgh-based Babcock Lumber Company with multiple locations throughout the state. West Virginia is home to manufacturing operations including Homer Laughlin China Company in Newell, Blenko Glass Company in Milton, Champion Industries in Huntington, Gabriel Brothers in Morgantown, MTR Gaming Group is Chester, and PNGI Charles Town Gaming. In December 2010, Ohio-based Macy's announced plans to construct a 1.3 million square foot, $150 million distribution center in Berkely County, creating 1,900 jobs. Major media entities in the state include Marquee Cinemas, which operates theatres from Connecticut to Florida, West Virginia Media Holdings, West Virginia Radio Corporation in Morgantown, West Virginia MetroNews, and Ogden Newspapers in Wheeling, which operates publications from Hawaii, Florida, Minnesota and to New York. Terradon Communications Group, located in Poca, is a leader in website design and development, with clients including Whirpool International. Others include Texas-based Aegis Communications Group. A giant slalom competitor at a USCSA event for the Southeastern Conference at Snowshoe Mountain. The Greenbrier located in White Sulphur Springs once housed the emergency bunker of the U.S. Congress. In 2010, tourism generated an economic impact of $4.27 billion and 44,400 employment positions. Major tourist attractions include state's premier skiing destinations such as Snowshoe Mountain, Canaan Valley, Winterplace Ski Resort, Oblebay Resort, Elk River Touring Center, and White Grass Ski Touring Center. Other attractions include the Huntington Museum of Art, the Mountain Quest Institute in Pocahontas County, Avampato Discovery Museum in Charleston, the Oglebay Institute in Wheeling, West Virginia State Wildlife Center in French Creek, Greenbrier Resort, Pete Dye Golf Club, Samuel Taylor Suit Cottage, Blennerhassett Island Historical State Park, Moncove Lake State Park, Camden Park in Huntington, West Virginia Zoo, West Virginia wine, Prickett's Fort State Park, Blackwater Falls State Park, the Mountaineer Race Track & Gaming Resort in Chester, Mardi Gras Casino and Resort near West Virginia, Wheeling Island Racetrack & Gaming Center, Hollywood Casino-Charlestown, the Scottish Heritage Festival in Bridgeport, Italian Heritage Festival, Vandalia Gathering in Charleston, Appalachian String Band Music Festival, West Virginia Coal Festival in Madison, the Johnny Johnson Blues and Jazz Festival, the Music in the Mountains Bluegrass Festival, the Appalachian Festival in Raleigh County, and the BBQ & Bluegrass Festival. Farming is practiced throughout West Virginia, but in a form different from large extensive cash-crop agriculture elsewhere in the USA. The modal average farm size was a smallish 140 to 179 acres (567,000 to 724,000 m²), most statistics in this section are taken from the 2002 US Census of Agriculture for West Virginia, which sold less than $2,500 of crops annually. Family and single-owner operation worked 92.7% of the farms, and an astounding 96.9% were totally or partly owned by the operator. On the other hand, only 50.5% of the state's farmers considered farming to be their primary occupation, with a significant number of hours worked elsewhere each year. The rural poverty rate in West Virginia is 20.4%, five points higher than the urban poverty rate. In traditional frontier agriculture there was much gathering of wild "greens" and other vegetation to supplement the diet. One area where this practice is still significant is the gathering of wild North American ginseng, often for the Asian market. Wild gathered ginseng contributed about $2 million in 2000 to the West Virginia economy, a figure larger than many conventional cultivated vegetable and fruit crops. Other wild greens, such as sour dock, lambs quarters, and wild leek (or "ramps") are also still gathered by many for table use, although today more on the basis of avocation or keeping up traditions than out of necessity. Along the western edges of the state the large rivers of the mid-continent erode a distance into the hills and it is here, in the west, that some dense pockets of heavy industry appear. In the Kanawha River Valley near Charleston and along the southern Ohio River Valley near Huntington chemicals predominate, attracted by a readily available labor force and access by barge carriers. Metallurgy, especially steel, has been predominant in the Northern Panhandle due to a spill-over effect from the traditional center of the US steel industry in Pittsburgh. Due to the relative ruralness in West Virginia, the state isn't dominated by any major U.S. banks. In fact, the only Big Four bank with any retail banking presence in the state is the retail banking division of JPMorgan Chase, and only in the Charleston area. BB&T is the largest bank in the state, and the only major bank with a presence throughout the state. Huntington Bancshares and WesBanco each also have a significant presence in several areas in West Virginia. Other major banks in the state, but only in certain areas, include Chase, Fifth Third Bank, & SunTrust Banks in Charleston and PNC Financial Services in Morgantown. Map showing 2003 ARC economic designations for counties in West Virginia. The Appalachian Regional Commission was formed in 1965 to aide economic development in the Appalachian region, which was lagging far behind the rest of the nation on most economic indicators. The Appalachian region currently defined by the Commission includes 420 counties in 13 states, including all 55 counties in West Virginia, the only state whose entire territory is covered by the Appalachian Regional Commission. The Commission gives each county one of five possible economic designations—distressed, at-risk, transitional, competitive, or attainment—with "distressed" counties being the most economically endangered and "attainment" counties being the most economically prosperous. These designations are based primarily on three indicators—three-year average unemployment rate, market income per capita, and poverty rate. In 2003, West Virginia had a three-year average unemployment rate of 5.7%, compared with 5.5% nationwide. In 2002, West Virginia had a per capita market income of $17,856, compared with $26,420 nationwide. In 2000, West Virginia had a poverty rate of 17.9%, compared to 12.4% nationwide. Fifteen counties in West Virginia were designated "distressed," and sixteen counties were designated "at-risk." No county received the "attainment" designation, and only two—Jefferson and Putnam—were designated "competitive." Nineteen counties were designated "transitional," meaning they lagged behind the national average on one of the three key indicators. McDowell County had West Virginia's highest poverty rating (and the third highest in the entire Appalachian region), with 37.7% of its residents living below the poverty line. Kanawha County had West Virginia's highest per capita income at $25,170, and Monongalia had West Virginia's lowest unemployment rate at 2.7%. ^ a b "The World Bank: World Development Indicators database", World Bank. September 27, 2010. Accessed December 11, 2010. ^ "WV Economic Outlook 2016" (PDF). WVU. Retrieved September 19, 2016. ^ "State Exports via West Virginia", U.S. Census Bureau. March 26, 2014. Accessed April 11, 2014. ^ "W.Va. exports decline nearly $3B in 2013", The Charleston Gazette. March 28, 2014. Accessed April 11, 2014. This page was last edited on 13 February 2019, at 23:37 (UTC).